Info "Catch the drool in the bucket." Spitfall is one of Dr. Crygor's microgames in WarioWare: Twisted! The name is a pun on the words "spit" and "pitfall." The game's purpose is to catch the person's drool inside a bucket. To do so, the player has to move it until it gets below the falling drop. When done so, the drop will transform into a flower and the player wins the game. 1st level difficulty: There will be one person spitting. 2nd level difficulty: There will be two people, however, only one of them will spit. 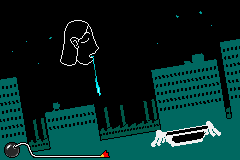 3rd level difficulty: There will be three people, however, only two of them will spit. A minimum of 10 points must be earned to clear this microgame.